"We could be brilliant, because the rise of the machines is happening." “You won't be going into a pharmacy every month when you're older,” predicts Cormac Tobin. This statement may sound ominous coming from the managing director of Celesio UK, which operates more than 1,500 Lloydspharmacy branches – dispensing 150 million items a year. But Mr Tobin is not predicting a future where mass closures have wiped pharmacies from the healthcare landscape. Instead, he is fleshing out a more positive vision. The Celesio UK chief talks to C+D across an oval table in the organisation's Coventry headquarters. On the tabletop between us, his voice-controlled, Amazon-built device – named Alexa – is "sleeping”. 'She' sits next to a pile of glossy paper: Celesio’s blueprints for the future. The presence of Alexa underlines the technological future Mr Tobin talks about, a future he believes will bring fundamental changes to community pharmacy. "When I'm old, I think the world is going to take care of me better," he says. Since the government's shock announcement in December 2015 that it planned to significantly cut the sector's funding in England, Mr Tobin has been preparing a plan to protect his pharmacies. While he can't rule out any job losses, the central plank of this defensive strategy is innovation. “[Change] frightens the life out of me in a way that really excites me," he explains. "We can't fight it. We're going to have to evolve. Mr Tobin considers that the drop in the sector's overall funding will indisputably damage the sector, and warns that pharmacy minister David Mowat may oversee the “demise” of the industry if he doesn't "develop" it. But he also sees the changes to the remuneration model as an opportunity; a catalyst to change the way patients use pharmacies. Take the move towards greater clinical care, signified by the introduction of quality payments. Mr Tobin wants every Lloydspharmacy branch to achieve all of these payment criteria; not just for the money itself, but to "show the government and the NHS that we changed the remuneration". He believes there are "a lot of good things" in the government's desire to tie funding to quality and services. "We're in a new era of relationships. But it needs both sides to work hard," he says. "The rise of the machines"
The booklets piled next to Alexa seem to back up Mr Tobin's beliefs. One of these, titled “We believe in reinventing health: Celesio UK proposition”, talks about how “our industry needs a completely different approach” and the “ambition to support positive living as market leader in the use of data for improving health”. Through Lloydspharmacy's Online Doctor service, the multiple has delivered medicines to more than one million patients since 2008. With 'Amazonisation' becoming an increasingly common buzzword in pharmacy circles, does Mr Tobin think this is the direction the sector should head in? Celesio is testing how the Alexa device could help dementia patients in the home – by providing prompts to take medicines, for example, or by offering to order repeat prescriptions for delivery at home or collection from the local pharmacy. “Is that wrong?" he asks. "It's moving [patients to the] centre of how we do things. “We could be brilliant, because the rise of the machines is happening,” he continues. Technology doesn't just help to reach patients, but also to understand them. For a new post, digital director, Mr Tobin recently hired Boots' Matt Poole – who told C+D earlier this month how he plans to use data to help drive the business and improve management of patients' conditions. Mr Tobin thinks the data made available by recent developments, such as wearable technology, is a chance for pharmacy to progress. “The information about health is becoming huge,” he says. Calls at a national level for improved connectivity, by allowing pharmacists to view patient records, also get the nod of approval. He praises the last year's 'Murray review' as “very good” and says the Community Pharmacy Forward View produced by a number of pharmacy organisations should be “the bible” for the industry’s direction. With a number of visionary documents doing the rounds, Mr Tobin says a key hurdle in moving the industry forward is a willingness to accept change. This is is “real dilemma in the industry”, he stresses. “Sometimes there's a thought process that's concerning: ‘Old people don't like some of these moves.' They do." He points out how younger generations now teach older people how to get the best out of technology. “My daughter now teaches my mother. She loves things online now that she never thought of, to make her life better for herself." But this doesn't mean Lloydspharmacy "disrespects people who see change as a problem", he says. "We want traditionalists; you cut them and they bleed the history of this organisation. They know where every skeleton is buried, where mistakes were made." His point is that the industry needs to react to people’s demands, especially if – as Celesio does – it plans to grow. It may help explain the company's decision to buy Sainsbury's 281 pharmacies, and rebrand them under the Lloydspharmacy name last year. "The supermarket environment is a very different one, it's doing very well," he says. "It's meeting a new world older – people want 'click-and-collect' more." Whether from a community pharmacy or a supermarket, Mr Tobin believes answering people's expectation of being able to order anything to their front door is a way to ensure the sector remains “relevant and compelling”. Not that he believes this has to come at the expense of face-to-face interactions with pharmacy staff. “How many other [professions] are going to ring a lady on a Sunday when they're not working, to make sure she's ok? How many people are going to spend two hours on a phone when a [patient] wants to commit suicide to talk her out of it? It's mind blowing. People still love the comfort of talking to a person." It's this balancing act between the possibilities of the future and the tried-and-tested benefits of the past that Mr Tobin seems eager to achieve. "As we say in Ireland: ‘Check Google and then ring your mother’." 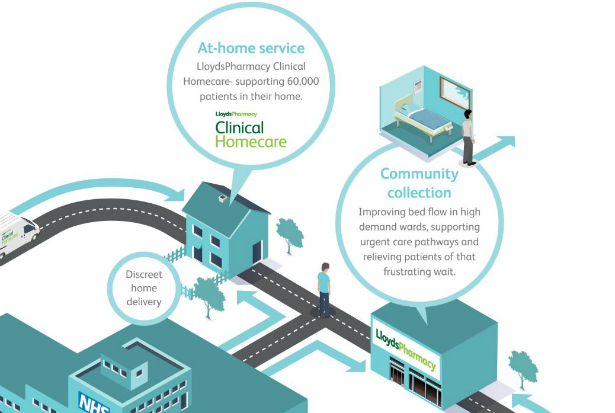 What do you think about Lloydspharmacy's plans for the future? What is wrong with all these large corporations? 94 year old 'auntie Flo' is expected to order her scripts on line? she sits at home lonelier than ever because she can't go to her local pharmacy because...... Hey! it's closed! what about all the other vulnerable people out there? are we to ignore them too? ring back more of 'The Chemist' selling hot water bottles, etc and the big corporations might see that they may make a profit yet. Mr Alan Lloyd had the right idea in the first place. the PERSONAL TOUCH. In Lloyds Pharmacies defence they have some of the best training going but what use is that when theres no-one to train because 'it's all online' and 'the shops are shut?. More pressure for the NHS then!!!!!! well done Celesio. Is this premonition, or his business plan? There are still services which will require face to face interaction in the future and pharmacy is one of them. In today's era of mass and complex polypharmacy, we need more connection with our patients and not less. I'm Irish and we don't say that. Just in case I'm missing something I googled the phrase and not one hit. What part of Ireland are you from Mr Tobin? "Alexa, I've run out of my blood pressure tablets, can you loan me some?" Alexa: "No. Ask Siri or Cortana." Cortana said " No Broadband connection. Had an outage and it has outraged me! Please contact your nearest pharmacy ( cannot tell you where), or NHS 111 or your local A&E".